Clop, clop, clop…the hooves of Cervantes, the gentle and magnificent Criollo horse, loudly prance along the dirt road as he carries me through the quiet Uruguayan countryside. Cervantes is calm, almost lazy as he leisurely stops every few minutes to nibble the lush grasses along the country road. The sun is low in the sky now, as dusk approaches. Roberto, the casero (ranch hand), turns around and signals that it’s time to go back to the ranch. We begin our return and Cervantes breaks into a gallop. Roberto chuckles and says in broken English that I’m ready for the Kentucky Derby. Cervantes continues his speedy return as I’m told it’s his dinnertime. Delicious food is consistently served at the Estancia and like Cervantes, I can’t wait to get back for the evening meal. The fare at Estancia Tierra Santa, near Carmelo, Uruguay, is creative, well-thought out, and memorable. The proprietor, Karen Vandergrift, a talented chef, makes all of the meals herself and takes real pride in what graces her tables. Tonight, dinner is served on our private terrace, just outside our room which overlooks fields of wheat and alfalfa, fruit orchards, and pastures of wildflowers. The table is a quaint, old sewing machine desk that has been covered in colourful mosaics and is just big enough for two. The stars are out and shine more brightly than I’ve seen in a long time. Karen and her housekeeper, Ester, have lighted candles to add to the ambiance of our romantic meal. My husband and I are drinking Pinot Noir from the Irurtia winery, the second largest vineyard in Uruguay and a neighbour to the Estancia. The wine is like liquid silk; soft, velvety, complex and with an intense ripe-grape aroma. The first course, a fresh and crisp salad, is served and eaten along with fresh, home-baked bread. The main course is served, the pièce de résistance, a fennel crusted filet or lomo as they call it in Uruguay. The beef is tender, flavourful, and melts in my mouth with the faint anise taste of fennel seeds. Dessert, a luscious, homemade chocolate cake is served next as we continue drinking our wine, laughing and enjoying our time together outside under the stars or al aire libre, in open air. Karen stops by to visit with us after the dessert course has been cleared by Ester. We give her our compliments and request the recipes for the meal which she gladly shares. She also shares some homemade lemongrass verbena soap that she’s made during her downtime. The soap, made with the herbs from her garden, smells fresh and citrusy. She gives us several bars, individually wrapped in paper and tied with ribbon, to bring home with us. Her hospitality makes us feel at ease and at home. Karen says goodnight and leaves us with another bottle of Irurtia Pinot Noir. My husband and I sit on our terrace, amidst glowing fireflies, and reflect on this perfect day beginning with our trip to the Four Seasons Resort in Carmelo for a trip to the spa and lunch by their pool, our visit to the nearby water hole in the afternoon and our horseback ride at dusk. It was a laid-back day in a laid-back town. Our day started when we awoke to the peaceful sounds of chirping birds. Even the birds sound content here. More than fifty species of birds have been counted on the ranch, making it a perfect bird watching destination. We made our way to the kitchen where Karen and Ester were preparing breakfast. Homemade muesli, home-baked scones, artisanal honey, buttered toast, fresh fruit, and organic farm-fresh eggs graced the beautifully and casually set breakfast table. We ate our breakfast with the other guests, a Brazilian couple and their two daughters, in Karen’s gorgeous, intricately tiled and spacious country kitchen. After breakfast we set out by car to the Four Seasons Resort in Carmelo, a short drive away. Nestled among pine and eucalyptus trees along the Rio de la Plata, the property lived up to Four Seasons’ standard of excellence. I took a natural European facial at the spa and revelled in each of the seventy-five minutes. Soft, soothing melodic soundscapes in a cool, dark room relaxed me as I received my facial atop a French terry cloth covered massage table. It was heavenly. After my treatment I met my husband by the pool where we ate lunch. We shared Choripán Casero, a sandwich of homemade Chorizo Sausage, Baguette and Chimichurri sauce (a traditional sauce made from bell pepper, parsley, garlic, oil, vinegar, and red pepper flakes). We also shared a trio of empanadas – beef, calabresa and mozzarella, and onion. 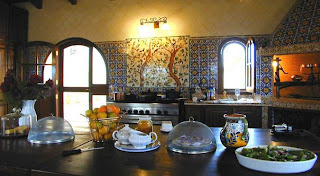 The food was good but it didn’t compare in quality or taste to the cuisine served back at the Estancia Tierra Santa. After our luxurious morning at the Four Seasons we visited a local water hole near the estancia. The water hole was an old quarry that over time has filled with rain water. It is frequented only by locals and we were able to get a feel for life and the spirit of the Uruguayan people. People of all ages swam in the water hole that afternoon, laughing, singing, swimming and floating in the cool clear waters, a reprieve from the days hot summer sun. Between cannon balls and calls to one another in incomprehensible Spanish, we received many friendly, welcoming smiles and waves from the locals. After our trip to the water hole we returned to the estancia for a refreshing glass of Medio y Medio, a drink of half white wine and half sparkling wine, very popular in Uruguay. We sipped our wine on the patio outside our room. The estancia itself is beautiful and an interesting backdrop to a relaxing afternoon drink. Once a part of one of the oldest estancia’s in the state of Colonia, Tierra Santa has been declared a sight of historic interest by the Uruguayan government. It was first used as an estancia in the seventeenth century by Jesuit missionaries. Later it was used as a grain mill, remnants of which can still be seen along the banks of the stream. The original building has been renovated and restored by Karen and her husband. Karen’s refined taste, sophistication, and vision has produced something truly brilliant here. The character of the original casa remains but has been elevated into an elegant yet comfortable alternative to the average overcrowded, uninspiring holiday accommodation. We took our Medio y Medio and strolled around the property, followed by Bronte and Phoebe, curious and energetic Black Labrador ranch dogs. We started out past the organic garden, full of salad greens, herbs, tomatoes, squash, and beans. We walked past the chicken coops filled with hens that lay eggs daily. We then met Claudette and Baubette, the hogs who were as tall as my waist. They were big, dirty, and as cute as could be. Karen gave us crackers to feed them and the two big girls enthusiastically munched the treats. Once the crackers were finished we walked away. Claudette and Baubette followed for a few minutes, snorting in exertion, until they realized our pockets were empty and turned around to lay in the shade of the trees. Next we met the sociable goats and then the sheep, which were frankly quite sheepish. We continued our stroll around the property and passed the estancia cows and horses that happily grazed the day away. We returned to our room and passed Karen outside on the patio. She noticed that I had been burned by the sun and kindly offered me rosewater to sooth my sore skin. I sprayed the fragrant water and filled the air with the smell of roses. We took a nap on our comfy bed in our first-class room and rested up for our horseback ride at dusk. Vacation is all about napping. When in real life do you have the opportunity to take a siesta? We awoke refreshed and set out to the courtyard where the saddled horses Fausto and Cervantes were waiting for us. All of the animals at Estancia Tierra Santa have literary names, another insight into Karen’s sophistication. Though Tierra Santa is sophisticated, it is also casual and comfortable. After visiting the Four Seasons I don’t know why anyone would fork out the cash just for the pretention of staying there. The accommodation we received at Tierra Santa far surpasses the Four Seasons and any other resort I’ve visited. That’s because Tierra Santa isn’t actually a resort, it’s a historic estancia, a working ranch, where the owner and staff take pride in their country and in their hospitality. Estancia Tierra Santa is a place where rosewater is the scent of friendliness, where shared recipes are the taste of fine cuisine, where chirping birds and running streams are the sound of relaxation. Tierra Santa is a place where you can siesta every day, where you can stay up late into the night drinking local wine under the stars, listening to the lulling buzz of the bugs in the darkness. It’s a place where a slower pace of life is treasured, a place where you can just…breathe. We are so very jealous of this beautiful experience. There are few things more incredible than coming back to nature and enjoying quiet yet exciting days on a farm on vacation. We did something similar in Friuli, Italy, although our small stays at the charming agri-turisms there pale next to the lemon verbena soap that Karen made!